I have been very busy! I've been playing with Spellbinders November Large Die of the Month! I have made a cute Christmas tree with a little box in it and 2 shaker cards! The Tree was posted yesterday and the shaker cards will be Friday and next Monday (at least that's the plan). If you click on the picture to enlarge the cards and tree are near the base of my OTT light just to the left of the ink pads. 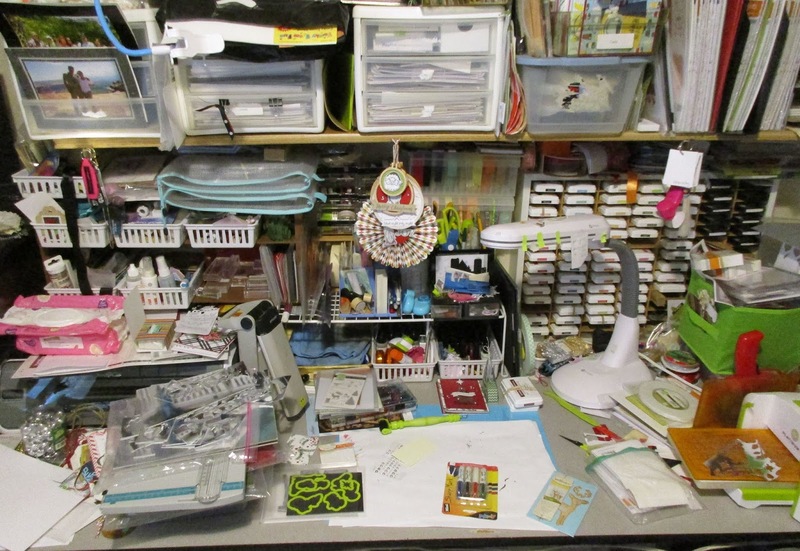 Also there I have a pile of card stock sitting on my ArtBin of Spellbinder dies, some green dies that coordinate with the stamp set under them, some markers (I cleaned my computer desk and those have not been put away), a Spellbinder deer die I got free, my baggie of foam pop dots and my Platinum 6. Behind those items, who knows what. I really need to clean my table! Here is our new lamp on the kitchen countertop. I would love to find 2 ceiling light fixtures to match. 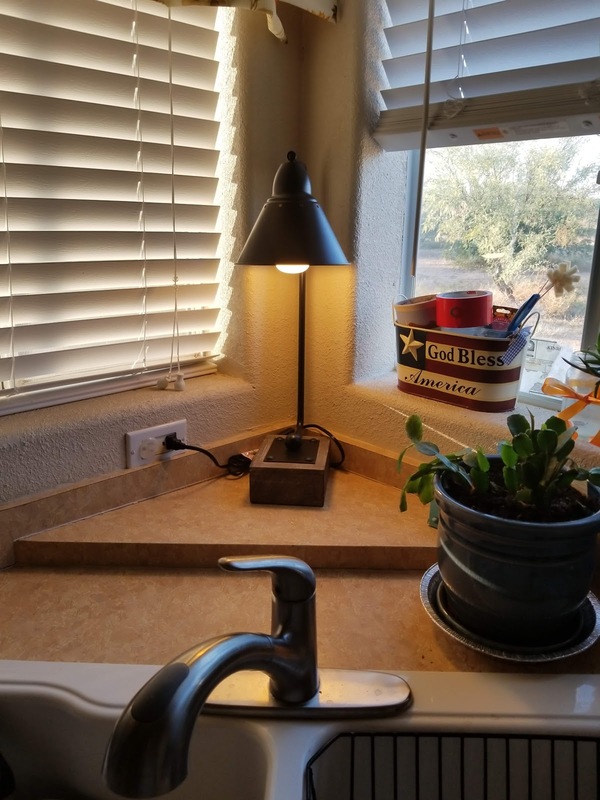 Our current fixtures came with our manufactured home and I'm tired of them. I do have a request... I've been trying to make some graphics to share on Pinterest and maybe Instagram. How does the following look? Is it big enough? I love how some of the projects on Pinterest show a project and it's close up along with some text all together and I was playing on my Print Shop a bit. I haven't the foggiest idea what I'm doing. Well, hmmm.... I started this post with that. Anyway... you've reached the end and please head over to the Stamping Ground and check out the other desks. You'll even find some cool projects!! Afternoon Carol. I don't do pinterest, so can't help there, I'm afraid - I'm sure many others will though! I've seen the adverts on the TV for getting Alexa to turn lights down, answer questions, etc... fun, but I don't suppose I shall get around to investing. I like the lamp on your kitchen top - it's in a great position there. I popped to have a look at the Christmas tree box - it's so clever and a really great idea, perfect for popping small gifts into and making them look amazing!! Love your lamp and the thought of telling it to switch on!! had a look at your Christmas tree..... love it. Thank you for sharing.